"Maybe you'll find your own fireworks on the cruise?" Sony Pictures has debuted a new official trailer for the animated sequel Hotel Transylvania 3: Summer Vacation, once again directed by the animation mastermind Genndy Tartakovsky. This series has (apparently) already established a strong fan-base, so this is just continuing the series for them mostly. 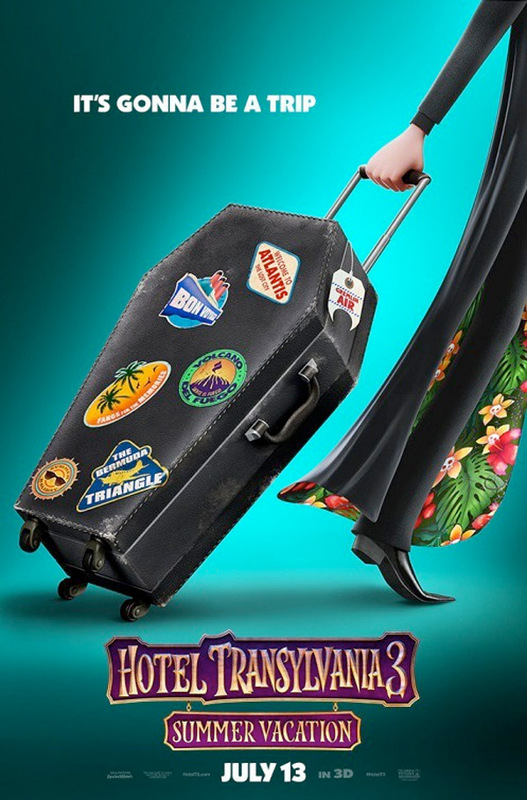 Hotel Transylvania 3 brings back the "Drac Pack" and his family/squad, this time going on a summer vacation cruise. Drac falls for the "intriguing-yet-dangerous" captain of the ship, but she actually has it out for him. This again featuring the voices of Adam Sandler, Selena Gomez, Andy Samberg, and Genndy Tartakovsky. This isn't really for me, but I know it has a big audience. There's some cool monsters and horror riffs in this, worth a look just for those things at least. You can also still see the first trailers for Hotel Transylvania 3: Summer Vacation here, for more footage. Mavis surprises Dracula with a family voyage on a luxury monster cruise ship so he can take a summer vacation from providing everyone else's vacation at the hotel, and the rest of Drac's Pack cannot resist tagging along. The monsters are all having a great time, indulging in all of the shipboard fun the cruise has to offer, from monster volleyball to colossus sized buffets and exotic excursions, but then the unexpected happens as Drac falls for the intriguing-yet-dangerous captain of the ship. Balancing family, friends, and a budding romance might just be too much, even for the most powerful vampire. Hotel Transylvania 3: Summer Vacation is yet again directed by talented Russian animation filmmaker Genndy Tartakovsky, of "Samurai Jack", "The Powerpuff Girls", "Dexter's Lab", "The Clone Wars", plus Hotel Transylvania 1 & 2 previously. The screenplay is written by Michael McCullers & Genndy Tartakovsky. Sony will release Hotel Transylvania 3 in theaters everywhere starting July 13th this summer. Looking better?